These adorable square glass favor jars resemble old-fashioned apothecary jars, right down to their real cork stoppers. 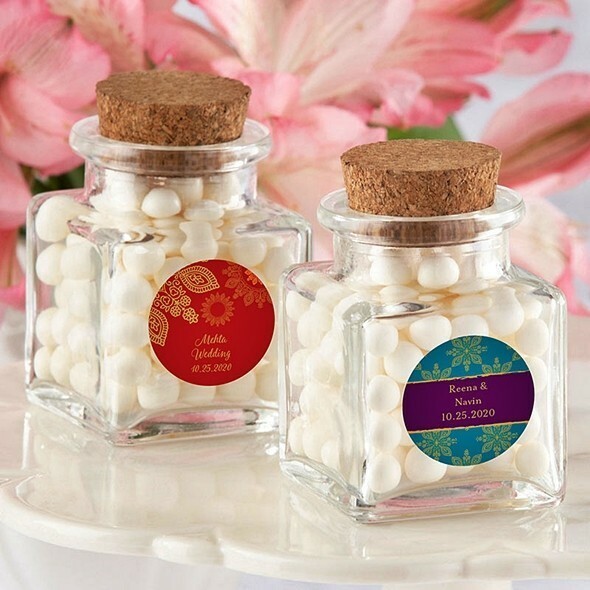 Personalize each favor jar for your Indian Jewel-themed bridal shower or wedding reception with your choice of two colors for the round stickers (in the pictured fonts only). Pictured contents are not included. PLEASE NOTE: Personalized labels arrive unattached from the bottles, so some assembly is required. Sold as a set of 12 and prices quoted below are per set.